Butterflies represent metamorphosis and freedom across all cultures; ‘On the Wings of Freedom’ is about the transformation of the city. The city is a place where people can continuously be inspired, not only culturally but also socially; a place for ongoing change and progress. ‘On the Wings of Freedom’ symbolises this potential change and evolution. 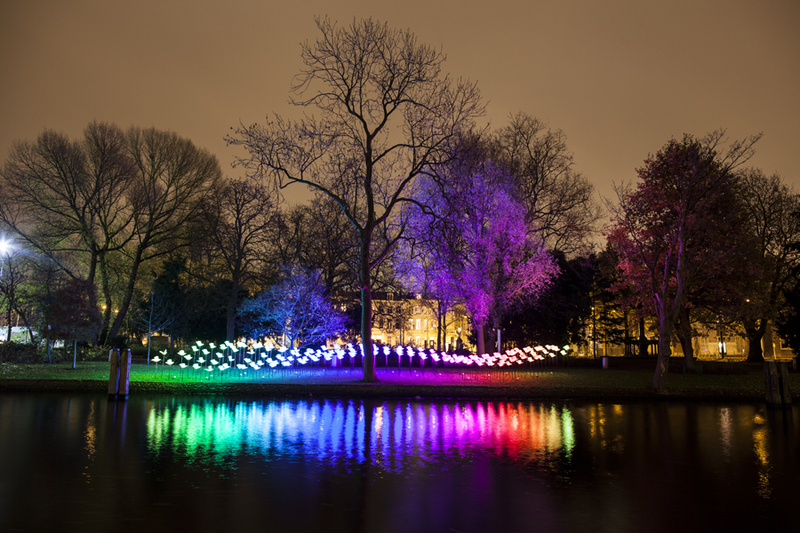 People can interact with the installation and have an impact on the behaviour of the lights through their mobile phones; the lighting effects activated by the audience include geometrical patterns, dynamic waves of colours or vibrant rainbows. The swarm of butterflies creates an array of RGB LEDs and are choreographed for rich lighting effects based on the audience interaction.The installation consists of 180 butterflies made of die-cut recyclable diffusive plastic, encasing hi-luminosity and individually addressable RGB LEDs. The electronics of each butterfly consist of custom electronic circuits allowing each butterfly to be individually controlled in colour; the control system includes a wireless access point, a Rasperry Pi running DHCP and Web servers and an Arduino providing real time interface to the lights through custom-built DMX circuitries. This hardware stack is integrated by bespoke software created in house by Aether & Hemera for allowing visitors to change the patterns and colours of the lights through their smart phones. To determine the final layout, Aether & Hemera studio coded an algorithmic software for visualising the installation in 3D based on different input parameters. ‘’With our installation’s dynamic waves of colours we wanted to celebrate Amsterdam’s bubbles and buzzes of activities, thoughts and interactions’’.